Epic’s now the target of another lawsuit over Fortnite dances, but this one is a bit different from those we’ve noted so far. The Fortnite fan known as Orange Shirt Kid entered a contest to get a dance into Fortnite, and outpouring of support from the game’s community saw Epic eventually put his moves in the game as ‘Orange Justice.’ Now his mother is suing the company for ripping off the dance. 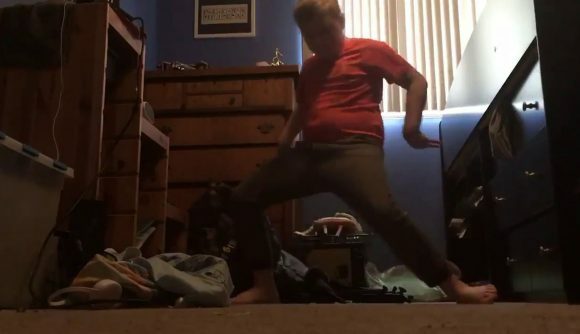 Orange Shirt Kid submitted his dance to Epic as part of the BoogieDown contest. While another entry won the grand prize, the kid’s goofy moves were so popular that they spawned a ‘justice for Orange Shirt Kid’ campaign among the community. Eventually, Epic saw fit to include that dance in the game. The suit also says that Orange Shirt Kid was the victim of “extreme cyberbullying,” which led to the closure of social media accounts on YouTube and Instagram. His Twitter was reportedly hacked after his rise to fame, and the original account is currently suspended. That now-missing account is also where the original submission for the contest was made, and where Orange Short Kid’s tweet of “THEY ADDED IT OMGOMG” was posted after the dance was added to the game. Pierce Bainbridge Beck Price & Hecht LLP is bringing the suit to court, and the firm has also filed suits on behalf of 2 Milly, Alfonso Ribeiro, and Backpack Kid over dances like Milly Rock, Fresh, and the now-ubiquitous Flossing move. The ultimate result for all of these cases remains undecided. Whether Orange Shirt Kid’s contest entry will make any difference in the court case remains to be seen as well.